I have been twiddling with the resistors on the CRC smoothing circuit because they have been running to hot. Since the transformers I used were for 220V primary, and I was building for 230V, the standard R1 100R 1W was changed to 6K 2W to reduce voltage. 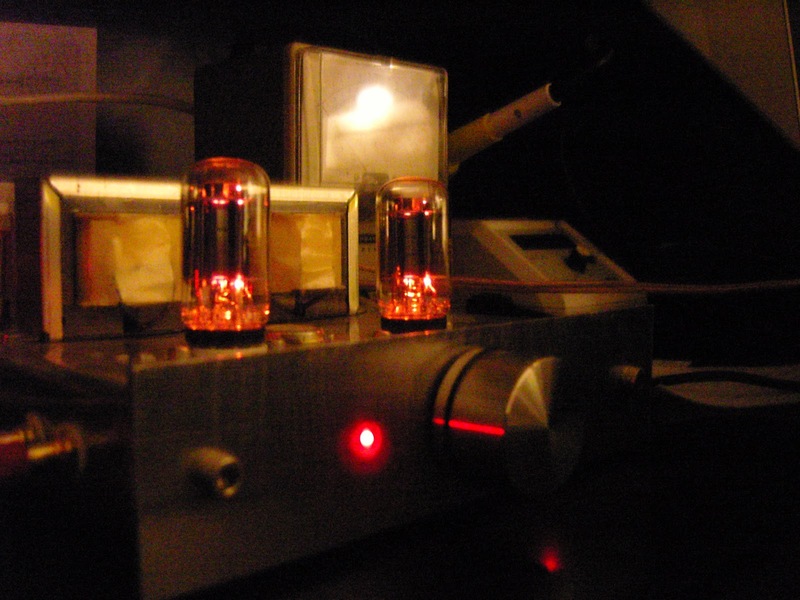 For 13EM7 tubes I have tried full base RCA´s and coin base Sylvanias with no discernible difference. *NOTE March 2011: later I changed the CRC resistor to 1.8Kohm. 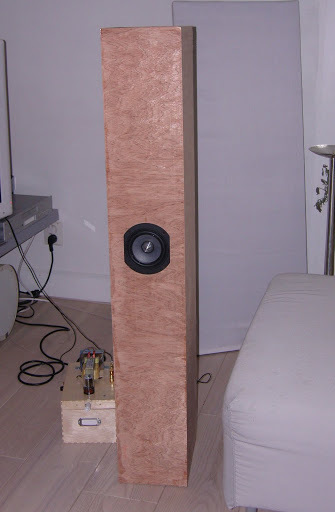 Now I am right on target with B+ and bias and it sounds hot on the Visaton Eminence openbaffle. Finished! the 13EM7 amp today! 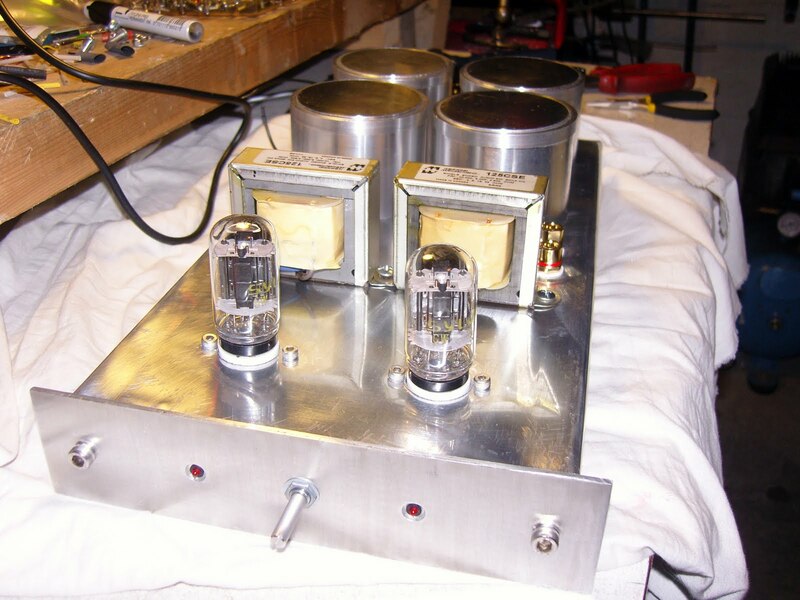 Here are two videos that describe the inner workings of this amplifier. They are for infotainment only. please DON´T attempt to build anything based on this description! 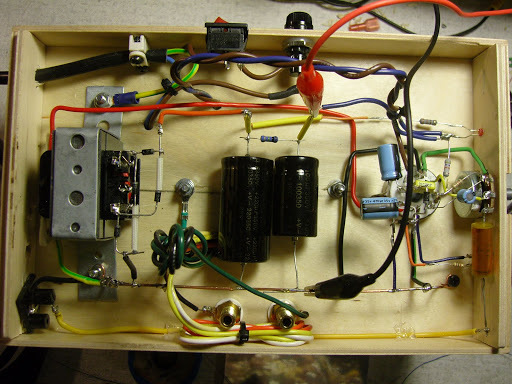 After much surfing I decided on Fred Nachbaur´s Miniblok SET amplifier for my first foray into amplifier building. Se Fred´s website for a detailed description of how it works and what it is good for. I decided to build the prototype on a wooden box from IKEA. that way I could keep a clean and safe exterior, and I could turn the lid over so it was just as stable to work on upside down. I ordered most components from Parts Express and Parts connexion. Found power transformers in some cheap local battery chargers, and ordered 13EM7 tubes and Hammond 125 CSE output transformers from Norwegian supplier Motron. 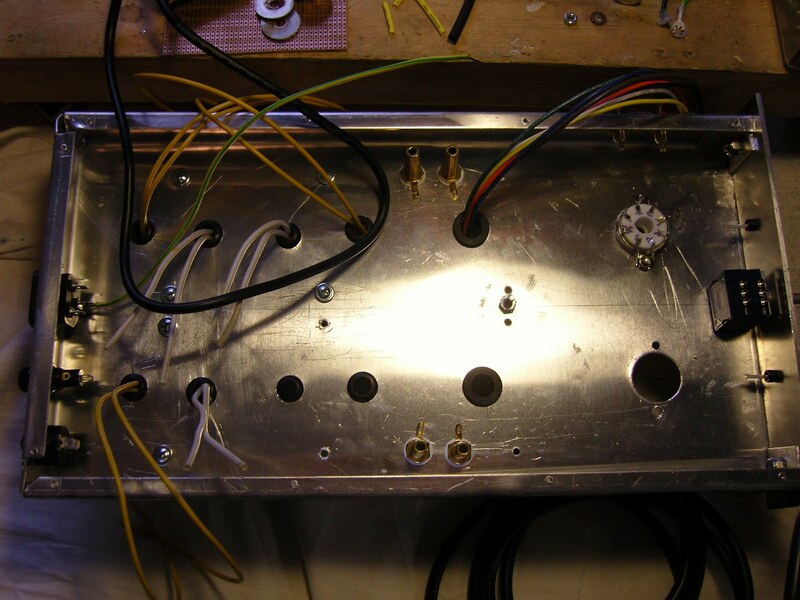 Then it was just a matter of soldering everything together. This is the finished circuit. I have not cut wires and component leads down because I was planning to transplant the design into a double mono chassis if I was pleased with the sound. I did a couple of stupid things here, like running heater negative on the ground bus, and getting the wires to the output transformers right in among the 235VAC, but actually it settled down after 5 or 10 hours of burn in and behaved well with no audible hum on the 89db/w fullrange BiB horns I built to play them on. Here is a view of the first serious listening session. 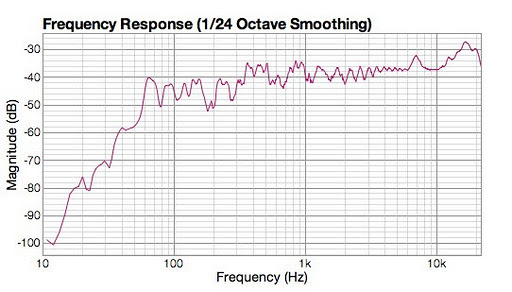 Update 21.october 2011: Here is the frequency response measurement of the 13EM7 playing through the Tangband W4 TQWT. Measurement is done through a Panasonic WM61 into Mac Pro with FuzzMeasure. the signal is sent to the amp through a M-Audio Fasttrack. 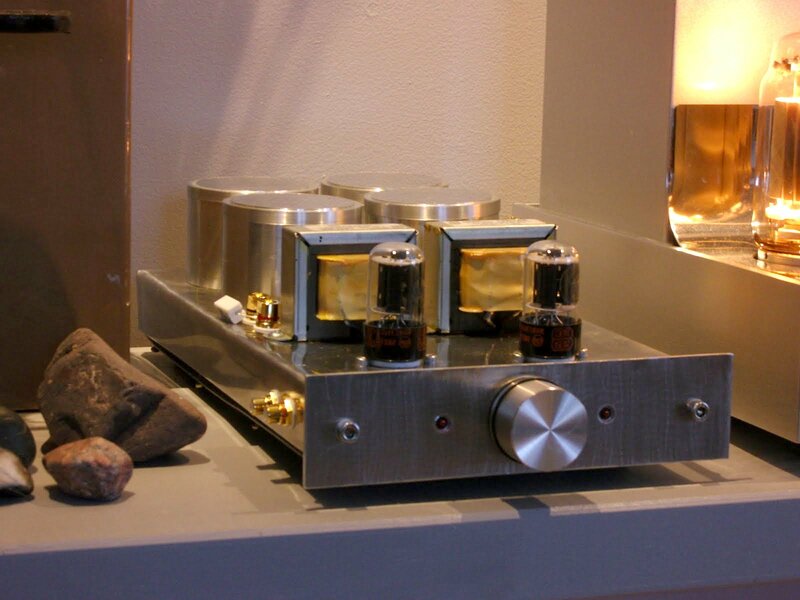 The Tangband has Fs of 80Hz, the output transformers of the 13EM7 amp go down to 60Hz.